Steps to use Shadow Receiver with Projector | Nyahoon Games Pte. Ltd. If you don’t have a “Layer” for your large environment object yet, add a new layer (let’s say “Environment” layer) and assign it to the environment object. 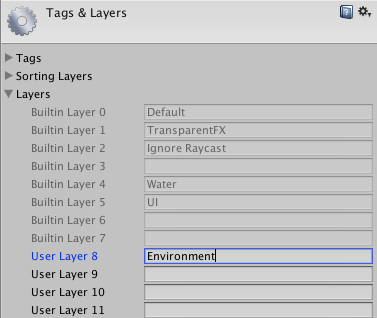 You can open “Tags and Layers Manager” by selecting “Edit > Project Settings > Tags and Layers” menu. Add “Environment” layer to “Ignore Layers” of your projector object(s). 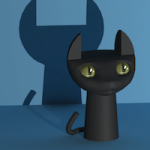 If you don’t have any projector objects yet, import “Projectors” package and drag “Standard Assets/Projectors/Blob Shadow Projector” into your scene. Assign a projector object to the shadow receiver component created at step 3. Assign “Invisible” material to MeshRenderer component of the game object created at step 3. “Invisible” material can be found in “FastShadowReceiver/Materials” folder. This step will be done automatically at step 4.
as “target” property , if you created InfinitePlaneShadowReceiver at step 3.
as “MeshTransform” property, if you created MeshShadowReceiver at step 3.
set “Raycast Mask” to “Environment” layer, if you created RaycastPlaneShadowReceiver at step 3. 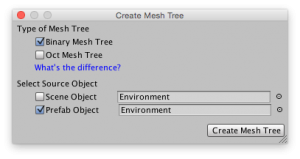 If you created MeshShadowReceiver at step 3, you need to create a Mesh Tree, and set it to “Mesh Tree” property of MeshShadowReceiver component. If no “Mesh Tree” has been set, and “Mesh Transform” property is set as described in step 6, you can find “Create a new MeshTree” button. Repeat steps from 3 to 6 for any projector objects which are not yet assigned to any shadow receiver objects. If you have multiple projectors, assign a unique layer to each shadow receiver object, and modify “Ignore Layers” property of each projector so that each shadow receiver can receive only the shadow from the projector assigned to it. For more details, please have a look at “MultiProjector – Plane” and “MultiProjector – Mesh” demo.